A super quick sauce that can be used for spaghetti, pizzas or on chicken or eggplant Parmesan. This sauce is so quick and tastes so much better than jarred sauce, give it a go! If you don’t think the 20 minutes is worth having fresh ingredients for dinner, double or triple the measurements and you can make a bunch of dinners for the future in about 30 minutes (it just takes a bit more chopping)! Freeze some of the sauce, and pull it down a day or two before you want to use it. Portion it properly for full dinners and you are all set. Tip: As mentioned before, do not use aluminum foil when storing tomato sauce, unless you put clear wrap under it. The acidity of the tomatoes will make holes in the foil. 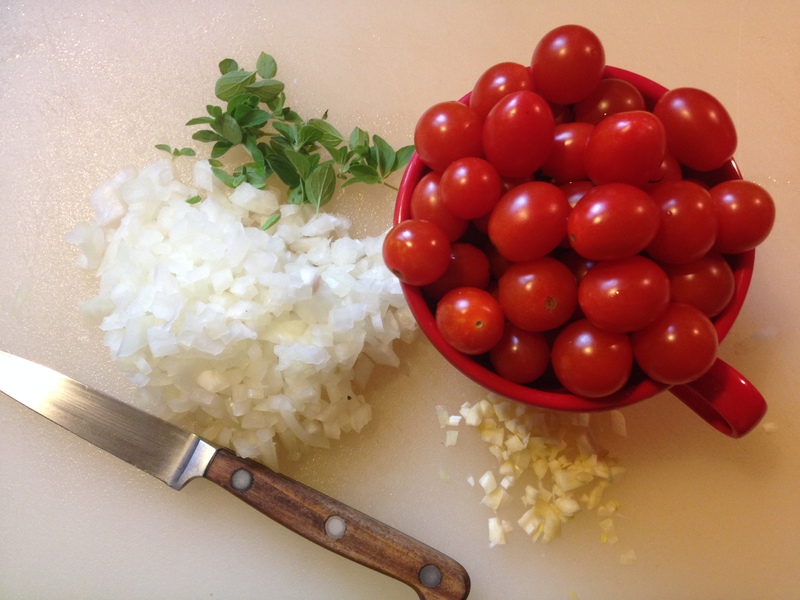 Chop the onion and garlic; then remove the stems from the tomatoes and squeeze out some of the seeds. Add olive oil to a nonstick pan and heat for a couple of minutes on medium-high flame. Add the onions, salt them and heat them for 3 minutes. Then add in the garlic and heat for another 1-2 minutes. * If you like more spice, you can add in a few red pepper flakes with the onions. Add in the cherry tomatoes and the can of whole tomatoes (cut them up a bit with a kitchen scissor or knife). Cook while stirring frequently for 10 minutes (or more if you have the time), add in the herbs, salt and pepper to taste. Pour the sauce in a big bowl and use an immersion blender to make it into the correct smooth consistency. 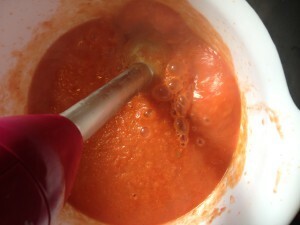 If you don’t have an immersion blender you can use a regular blender or Cuisinart. Sauce is ready to go! Add in the hot pasta and stir, layer it on eggplant or chicken cutlets, or spoon it on pizzas. Didn’t know you could do this so easy! Tomorrow night I’m making sauce!